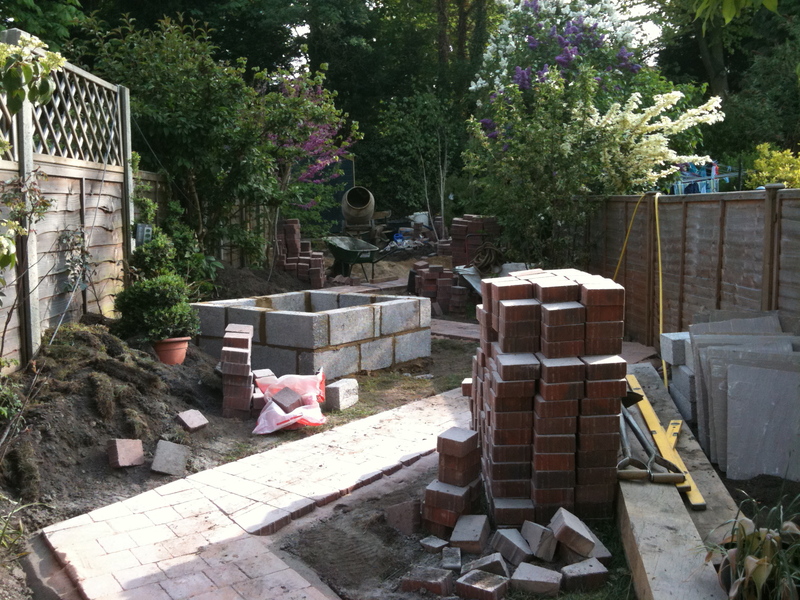 Back in 2011, April 26 saw the fourth day of work in the garden, and now it really began to take shape. There were four guys working on it, the landscaper and his labourer, plus two brilliant bricklayers who were laying the path and sitting area. We also had the electrician stopping by; he would not complete his work until the garden was finished, but we needed to install the cable up one side of the garden, crossing beneath the sitting area and back down the other side – there was some juggling of priorities to be achieved, so I kept my distance – supplying tea and coffee at regular intervals and dreaming of the day when it would be finished. My time in the garden was restricted to the end of each working day when they had gone home, and I’d walk round capturing progress on my phone. Now when I look at the photos from last year I thank my lucky stars for the weather we had – it was dry and sunny every day. Whilst this meant I had to keep watering all the plants patiently waiting in their pots I shudder to think what this scene would look like with the rain we’ve had lately, it would certainly have delayed the work and made the guys very miserable. In case you are wondering, the grey square installation is the raised pond! This entry was posted in Creating my garden, In my garden and tagged building, electricity in the garden, gardening, landscaping, pond, transformation. Bookmark the permalink. Gardens are a true labor of love. It is fun to look back at the previous years to see how they have grown and changed.